The Greenwich Wind Farm in Ontario Canada consists of 43 each Siemens 2.3MW-101 wind turbines with nacelles mounted on 80m tall steel tubular towers. The 8.0 diameter shallow concrete foundations are tied down to competent rock with 16 post-tensioned strand anchors from Con-Tech Systems Ltd., Brockville, Ontario. Each anchor tendon contains 18 strands for an ultimate capacity of 4691 kN. The anchors have a bonded length of 5.0m and an unbonded length of 8.0m for an overall anchor length of 13.0m. Every anchor is field tested and all anchors are re-stressable, so their integrity can be tested during their service life. 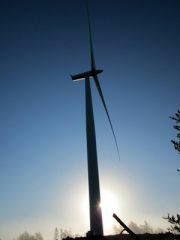 * Special thanks to Swan and Associates for the completed wind turbine photo in upper left corner of this page.